TRADITIONAL NAMES: Maire Titi / ?? (RR), Mirimiri Nū (MG), Tūrei ‘Āua (AT), Ngiengie (MK), Poenū (MT), Maire ??? (AK); COMMENT: Mitiaro - ear ornament (poe) of the Nū. KEY FEATURES: A erect, feathery fern to 120cm. ROOT horizontal or climbing, thick. FROND-STALK erect, to 50cm, glossy, with dorsal groove. BLADE to 50x50cm; alternate branches, subdividing 2-3 times. LEAFLETS (=pinnules) narrow-triangular, to 10x3cm, with basal lfts stalked, rest adjoined. 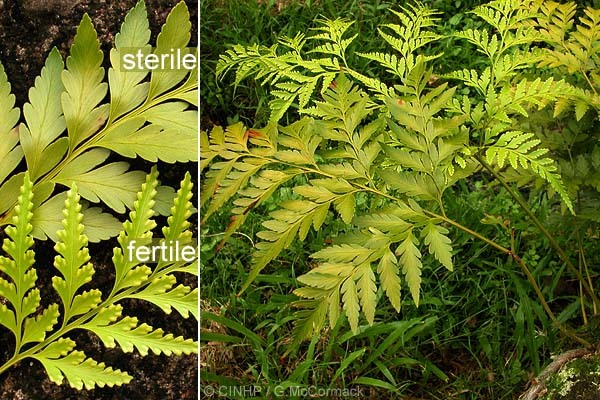 FERTILE FRONDS separate; leaflets smaller; sori at the tips.